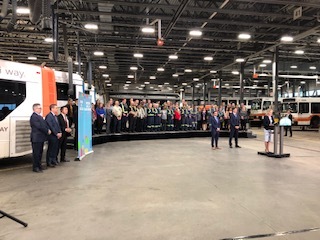 Yesterday, Prime Minister Justin Trudeau visited Mississauga’s MiWay bus maintenance garage to highlight the municipal infrastructure top-up, announced in the Government of Canada’s Budget 2019, Investing in the Middle Class. The top-up will double the amount of money municipalities receive this year through the Federal Gas Tax Fund. Since 2005, Mississauga has received approximately $437 million through the Gas Tax Fund helping the City move forward in delivering on its Strategic Plan and City-building initiatives. Development projects such as the Port Credit West Village (former Imperial Oil Lands), Port Credit Harbour Marina and Lakeview Village (former OPG Lands) will help transform the City’s waterfront in the coming years. With funding support, Mississauga can continue to successfully plan for the long term. Learn more about the City’s Budget and priorities in the 2019-2022 Business Plan & 2019 Budget.